as many of you know, i love to bake. and cook. but the only problem around here is that chad doesn't love to eat. (what type of person doesn't like to eat?!) so the majority of the things that i bake/cook end up being shared or frozen for a later date. but, that is not the case with banana bread. which is a great thing, i love banana bread. it can be served as desert, or you can have it for breakfast (sweets in the morning, my favorite thing). however i sometimes forget about how much i love banana bread until someone brings it up. and the other day, both chad and laurel (my sister) made references that banana bread should be made. so with that- laurel came over, we made banana bread, and snacked on brie cheese with apples. add chocolate chips if you would like! 2. cream the sugar and butter in a large bowl. then add eggs. 3. add bananas, milk, and cinnamon. 4. in a separate bowl, add flour, baking powder, baking soda, and slat. then add dry ingredients (and chocolate chips if you decide to go that route!). do not over mix. 5. pour batter into pan and bake for 1 hour and 10 minutes. 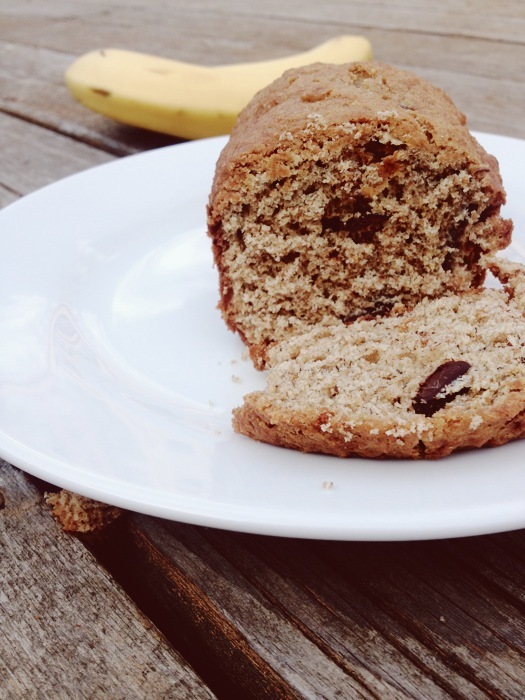 banana bread is one of my all time favorite treats! i love when the middle is not fully cooked. yum. lovelovelove banana bread, now I really want to make some! This is one of my absolute favorites =) This with a cup of coffee?! A little piece of heaven. I love banana bread! Thanks for sharing the recipe. He doesn't love to eat?! I've been wanting to make banana nut muffins for a while but I'll have to try these instead. Yum! Oh this looks delicious! I found you through the beYOUtiful you giveaway. Figured I should follow and support everyone I am doing a giveaway with. Plus I love recipes. And your blog is freaking cute! Love it! I love banana bread too! I must say, I like to cook but non of us are big eaters so we often end up with either the same a fee days in a row (rather boring) or freeze it!